City of Koprivnica has been engaged in a number of strategies to promote cycling and walking and attain full accessibility of roads for all users. A wide partnership of stakeholders has been the key to success. In five years, a modal shift of 25% has been reached. City of Koprivnica is situated in the North of Croatia. With a population of 31000 in 2001 it was faced with numerous transport-related problems. Owing to the town's prosperity based on food and pharmaceutical industry, the number of private vehicles increased at an alarming pace, while public roads were in a poor shape, pedestrian pathways inaccessible to the disabled and cycling tracks few and unconnected. The resulting deterioration of air quality, traffic congestion and decreasing quality of life in the city center made the local government engage in a number of sustainable transport strategies. In partnership with educational institutions, traffic police,local businesses, non- governmental organizations and citizen groups in the areas of environment, sports and heath the local government engaged in two four –year programmes Town on The Move and Streets for People. Several projects were also undertaken, the most important being the current IEE project Active Access. These programmes have involved involved an intense reconstruction of roads including accessible pedestrian pathways and cycling tracks, energy-efficient lighting, widening of maintained green areas including new children's playgrounds, car-free zones and a public user-free bicycle rental scheme. The intense promotion of cycling and walking has been highlighted through European Mobility Week campaign in which City of Koprivnica has successfully participated since 2002, winning European Mobility Week Award in 2008. Citizens have been enthusiastically participating in this campaign, especially pedestrians, cyclists, the disabled and the children. 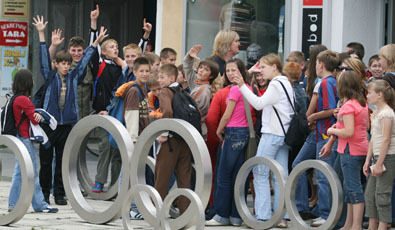 Through extensive education campaign involving kindergartens>and schoolteachers, students and parents, the number of cyclists and pedestrians is constantly increasing.Due to theft and vandalism, the free bicycle rental scheme had to be changed into a number of smaller schemes (school bicycle rental, Tourist Office bicycle rental).However, participation of local businesses has been only partially achieved, as the benefits of sustainable transport are not fully appreciated by all companies. The city of Koprivnica has been transformed by the sustainable mobility programmes. There is a 80 km –long network of cycling tracks and pedestrian footpaths in the city centre and an extensive network of scenic cycling routes in the city's environs. A network of Health paths particularly encourages walking for health and leisure. There have been 39 children's playgrounds and an exercise area for elderly citizens. Almost 50% of citizens regularly use bicycles as a means of transport for shorter trips to school, work, shopping and leisure. Boasting with the title of cyclists-friendliest town in Croatia and European Mobility Week champion of 2008. the city has re-affirmed cycling and walking as most popular urban transport modes. Among other impressive results, there is the Open-air Bicycle Museum containing seven replicas of most popular models of bicycles in history and a monument to the bicycle in front of the City Hall. Wide public participation has been the key to success, ensuring the "ownership" of the town's strategies by most individual citizens. The local experience has been shared by other Croatian towns which have been involved in a national network of towns promoting sustainable transport based on cycling and walking. The plan of calming the traffic in the vicinity of all schools and kindergartens and reallocation of road space to non-motorized traffic in the immediate city centre is currently being in progress, while every road reconstruction involves the addition of pedestrian footpath and/or a cycling track.